What would you do if your child was the Antichrist the destroyer of the world we live. Would you take care of your child raise it and hope for the best? 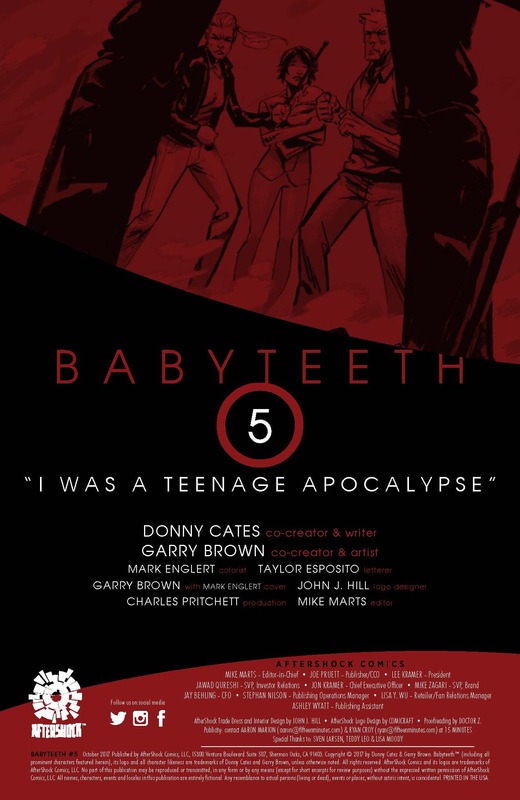 If you need a refresher check out our Review of Babyteeth #1 here and our review of the last Babyteeth #4 here. 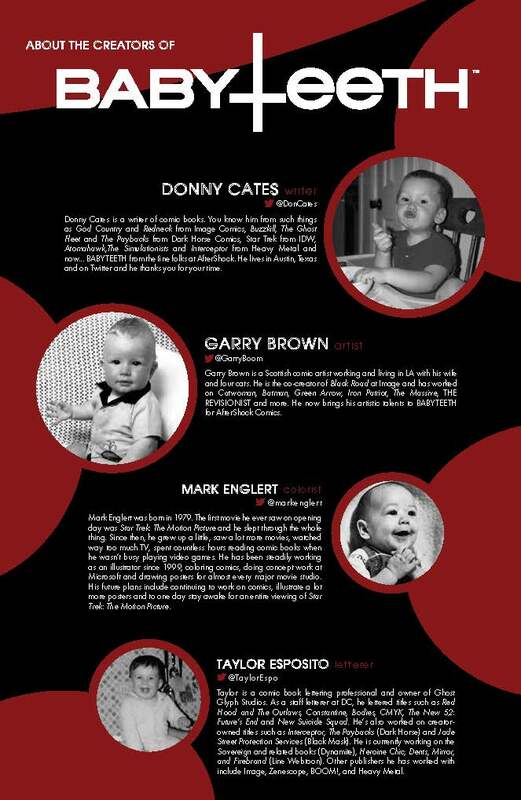 With the way, Issue #4 ended this issue of Babyteeth is highly anticipated. Sadie seethes in anger seeing Heather as Heather left her to explain everything. Sadie asks what the hell is going on, why is the assassin trying to kill her baby, when we meet a mysterious stranger. The mysterious stranger informs the group that the assassin name is The Prairie Wolf working for an organization known as the Silhouette, an organization who believes Clark is Evil and will bring about the End of Days. Sadie then ask’s who the man is and before he can answer takes care of somethings. The Man pulls the truck off the Prairie Wolf, telling the group she is in dire straits, but it doesn’t matter he fixes it using his powers to heal her as the man is a warlock. After treating the Prairie Wolf, the Man uses his powers to hypnotize her convincing her the mission was successful and family is dead. He then sends her to go back to the Silhouette and tell them to stop them from hunting Clark and the family. If they killed the Prairie Wolf, it would be a declaration of war to the Silhouette. Afterward, we find out the man is a member of the Way a group looking to protect and keep safe Baby Clark. The man is looking for a plane to take the family to a castle to keep them safe as it’s the castle of the King (Clark). The Issue ends something happens that results in more assassins coming for Clark to find out pick up the Issue Wednesday. 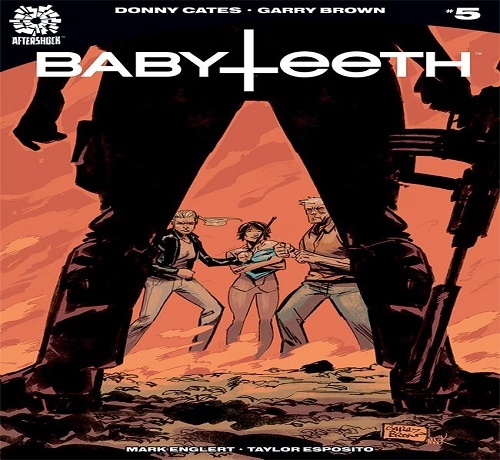 Another significant issue of BabyTeeth, Donny Cates is a master this issue starts filling in answers to a lot of questions while expanding the story to go to new places. The Introduction of this new character and the forces fighting for Clark allow the story to go into another level. I can’t wait to see where Donny Cates expands the story to as there are several places the story can go. 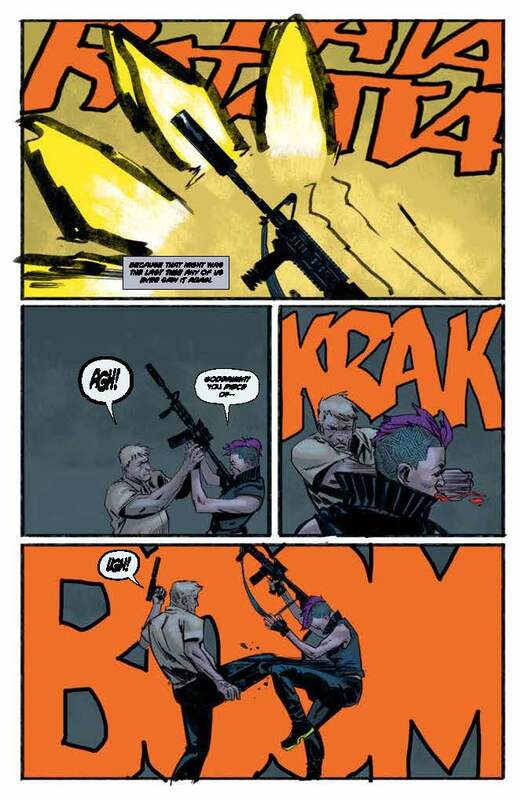 This series is another example of why Donny Cates is becoming one of my favorite writers. Garry Brown’s art and Mark Englert’s colors continue to shine especially the Flashback scenes. 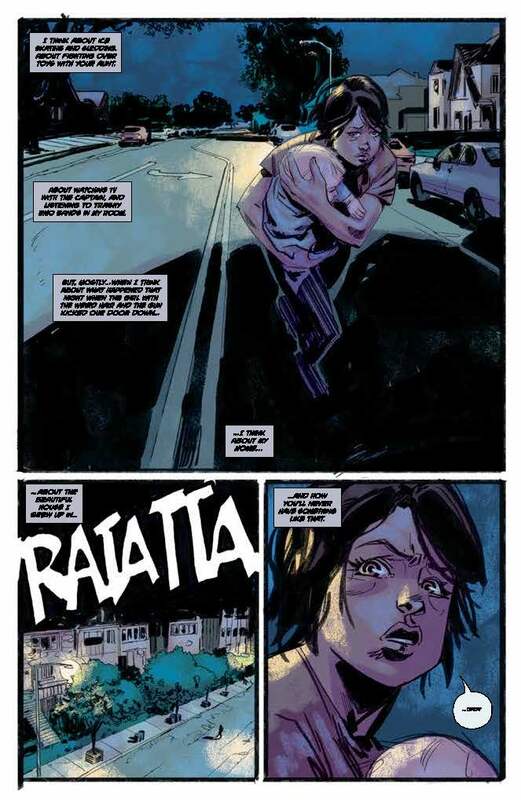 The way the art and colors are used in the Flashback scenes differentiates the scenes in the present day. 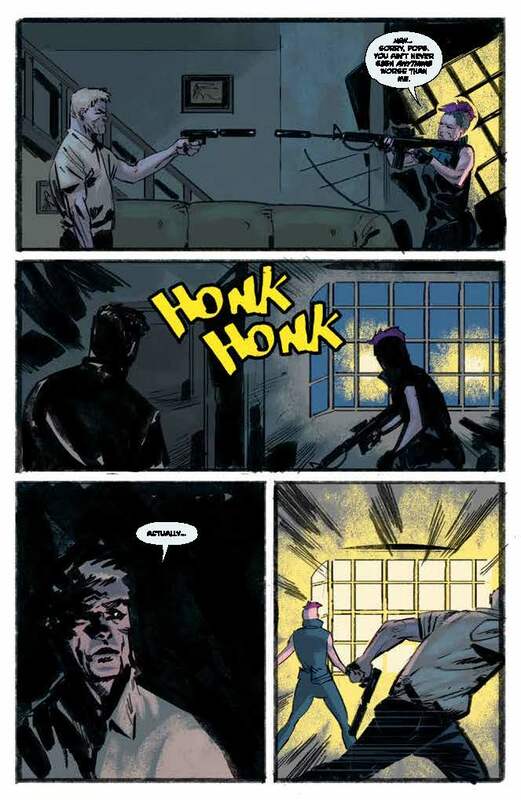 The Actions sequences and the backgrounds are brilliant and combined with the letters of Taylor Esposito make the scenes pop out. If you haven’t picked up Babyteeth, you are missing out on the best horror comic in the market do yourself a favor add this to your pull list and pick this up Wednesday.